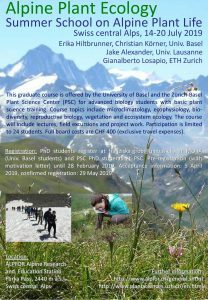 A graduate course offered by the University of Basel and the Zürich-Basel Plant Science Center (PSC) for advanced biologyThe study of life and living organisms (from the Greek word 'bios' meaning life).... More students with basic plant science training. Course topics include microclimatology, ecophysiology, bio-diversity, reproductive biology, vegetation and ecosystemAll the living organisms (including people) in an area as well as its physical environment, functioning together as a unit. An ecosystem is made up of plants, animals, microorganisms, soil,... More ecologyThe study of living organisms in their environment, including where they are found and how they interact with their physical environment and with each other, for example through food webs.... More. The course will include lectures, field excursions and project work. Participation is limited to 24 students. Full board costs are CHF 400 (exclusive travel expenses). Registration: PhD students register at franziska.grob@unibas.ch, at MOnA (Univ. Basel students) and PSC PhD students at PSC. Pre-registration (with motivation letter) until 28 February 2019. Acceptance information: 5 April 2019, confirmed registration: 29 May 2019.